Chris Froome (Team Sky) is the third rider in history to win the Tour de France and Vuelta a España in the same season. MADRID (VN) — There were a lot of firsts when Chris Froome (Team Sky) crossed the finish line Sunday as winner of the 2017 Vuelta a España. 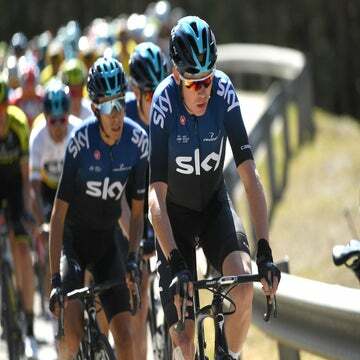 Froome is the first British winner of the Spanish tour. The Sky captain becomes the first racer to win the Tour de France and Vuelta in succession in that order. And he’s the first rider to win back-to-back grand tours in the same season since Marco Pantani won the Giro d’Italia and Tour in 1998. That’s impressive stuff by any measure. So where does Froome rank on the all-time greats list? For Froome, he said he’s not worried about where he lines up in the history books. Let’s take a look. With four Tour de France victories and now one Vuelta a España crown, Froome joins some elite company. With five grand tour victories, and the retirement of Alberto Contador (with seven official grand tours), Froome is now first among active riders with most grand tour wins. He nudges ahead of Vincenzo Nibali (Bahrain-Merida) with four, including two Giros, one Vuelta and one Tour. The 32-year-old joins Gino Bartali, Alfredo Binda and Felice Gimondi, all Italians, who also won five grand tours during their respective careers. Eddy Merckx leads in the all-time list with 11 grand tour victories, followed by Bernard Hinault, with 10, Jacques Anquetil, eight, and Contador, Fausto Coppi and Miguel Indurain, with seven. After finishing second three times, Froome finally got it right this year at the Vuelta. Froome joins Hinault and Anquetil as the only rider to win the Vuelta and Tour in the same season. And he is the first to win the Tour-Vuelta double since the Spanish race moved to late summer in 1995. The Tour-Vuelta double pushes him into more elite company. Only Merckx (1970, 72-74), Hinault (1978, 82, 85), Anquetil (1963, 64), Contador (2008), Coppi (1949, 52), Giovanni Battaglin (1981), Stephen Roche (1987), Pantani (1998) and Indurain (1992, 93) have won two grand tours in one season. Winning four of the past five Tours is impressive by any measure. Froome has emerged as the best Tour rider of his generation, and this Vuelta victory will bolster the argument that he’s one of the all-time best in history. What’s left? The Giro d’Italia, of course. When asked if the Giro is on the radar any time soon, Froome demurred when asked last week. The main goal for Team Sky right now is to win a record-tying fifth yellow jersey with Froome in 2018. Of course, not counting Lance Armstrong’s scandal-tainted seven wins, Froome would join the elite “five win” club with one more yellow jersey. Froome’s and Sky’s ambitions know no bounds. The team is certainly already plotting the next few seasons. Froome hinted at the beginning of the season he imagined racing “five more years” at the top level, and announced a contract extension through 2020 with Team Sky. If he can avoid a major injury, Froome will certainly be a force for the next several years. Team Sky has never won the Giro, and will certainly want to add it to its palmares, ideally with Froome. There are even rumors of trying to win all three grand tours in one season, a feat that no one’s done in cycling’s history. Right now, Froome places in the upper middle ranks of the grand tour hierarchy. No rider has ever won four yellow jerseys without winning a fifth, so one more Tour win would push him in elite company. One Giro victory would put him into the grand tour grand slam club — only Merckx, Anquetil, Nibali, Contador, Hinault and Gimondi have won all three grand tours — and who knows how much further Froome can go. Froome is a fighter, and his Vuelta victory is a measure of his ambition and professionalism as well as Team Sky’s collective strength and depth. Backed by the dominant Team Sky machine, Froome will likely be setting a few more records before he’s done.